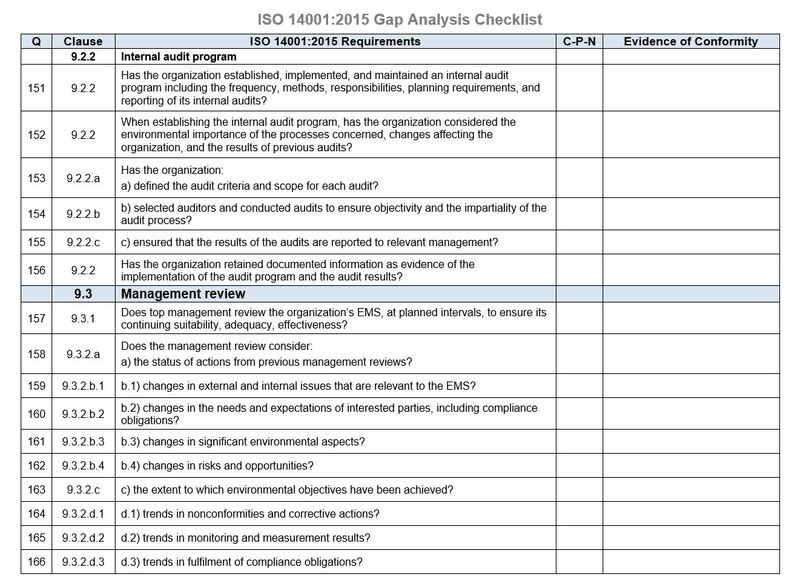 Larry Whittington has developed an extensive, 17 page, ISO 14001:2015 Gap Analysis Checklist. It contains 213 questions for organizations new to the ISO 14001:2015 requirements standard for environmental management systems. To purchase the checklist for $95, click on this Buy Now button to be taken to PayPal. You do not need a PayPal account to make a credit card payment and buy the checklist. The checklist will be immediately available for download as a Word file for ease of editing. Please click the “Return to Whittington & Associates, LLC” link on the PayPal confirmation page if you’re not automatically redirected to the checklist download page after completing the transaction. Please contact us if you have questions. The checklist has a section for identifying process owners and their managers in a Process Owners table. A Process Matrix includes ISO 14001:2015 clauses as rows and key processes as columns. The checklist can be used to evaluate the process areas with primary responsibility for the applicable requirements. The Status column indicates a C for Conforming, a P for Partially conforming, and N for Nonconforming. If not resolved prior to an audit, the gaps indicated by P and N will likely result in reported nonconformities. Interviews during the gap analysis are with the process owners with primary responsibility for the applicable requirements. Users of the process (secondary responsibility) are not interviewed. Their conformity level will be assessed in later audits after the system is implemented. After completing the checklist for each sub-clause, you indicate the overall conformity level for each row in the Process Matrix as Green for Conformity, Yellow for Partial conformity, and Red for Nonconformity. Click the sample checklist below to view a larger image. If you have any questions about the checklist, call Larry at 770-862-1766. Note: This gap analysis checklist can be used to evaluate the current conformity of an environmental management system against the requirements of ISO 14001:2015. Additional criteria for an environmental system may be specified in customer contracts, regulatory documents, and your organization’s own documents, but they are not considered during a gap analysis. These important other requirements should be addressed in later internal audits. If you have any questions about the checklist, please contact Larry at 770-862-1766 or larry@whittingtonassociates.com.